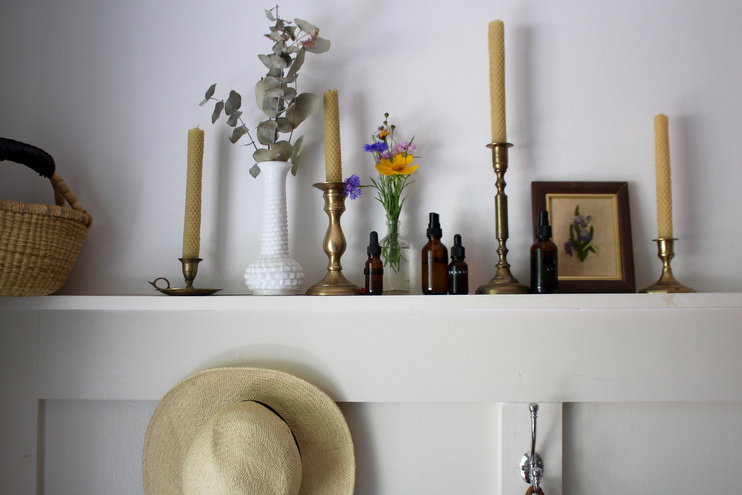 One of my favorite ways to use essential oils in our home is by making spray blends. It’s a simple way to incorporate oils into your everyday routines, and it also helps stretch the life of your brown bottles quite a bit. Getting started in making your own sprays can seem a bit intimidating at first, so I am going to break the process down for you so you can make your own for this summer season. Here are the ingredients and tools you need to get started. Glass Amber Bottles: Why dark glass? Due to the powerful concentration of molecules in essential oils, they are not friends with non-sustainable materials like plastic. Glass prevents the oils from breaking down the plastic, and thereby contaminating the oil. Essential oils can also spoil if they get too much natural light or heat, and the amber glass helps preserve and keep them pure. And always remember store your oils in a cool, dark spot as well. Distilled Water: Why not regular tap? Impurities in tap water can interfere with the quality of your spray, and it also cuts down on the shelf life of said remedy. When making products at home, always use distilled water (and distilled white vinegar if the recipe calls for it) to keep your homemade concoction from going bad. A Carrier Oil or Binder: You’ll need something to help the essential oils bind to and become dispersed throughout the mixture you are making. Dr. Bronner’s Castile Soap, witch hazel, aloe water, and various carrier oils like sweet almond and fractionated coconut oil work well. Essential Oils: Why does our family use Young Living? You can read up on that on this PDF I made, but here’s a bit more information you may not know about essential oils. When using essential oils, it’s extremely important to know where and how the plants used to make the oils were grown, harvested, and distilled, packages, and stored. The FDA does currently not regulate the aromatherapy industry, and therefore essential oils are considered cosmetics rather than drugs. Because of this, there are not strict guidelines places on the companies that make essential oils, and what that means is that each company can make them however they want, and packaging accordingly without regulation. So without full disclosure, you really don’t know what’s in that bottle. Because standards of quality control for essential oils do not exist in the US, it’s up to the consumer (you and me) to find reliable sources that are up front about the whole process from planting seeds to bottle oils. Unfortunately, most essential oil companies do not disclose their processes, and therefore get away with throwing labels like “all natural” and “pure” on the bottle when in reality, they may just be selling you a very diluted, non-pure, chemically treated version of an essential oil. Think about someone filling up a water bottle with ditch water and selling you “natural bottled water”. Yes, it’s natural, and pure, but do you want to be drinking it? When I learned about all of this, and the truth behind this induct, it made me confused and upset that companies could get away with deceiving their consumers into thinking they were making safe choices. This led me to do my own research on a company that discloses everything and uses organic and sustainable practices. I landed on Young Living and continue to appreciate their transparency about their seed to seal process. I am not paid to share this information, however I am a distributor for the company because our family uses these oils much and believes in the message behind the company. If you have more questions, I’d be happy to answer them in the comment section. Now, onto recipes. 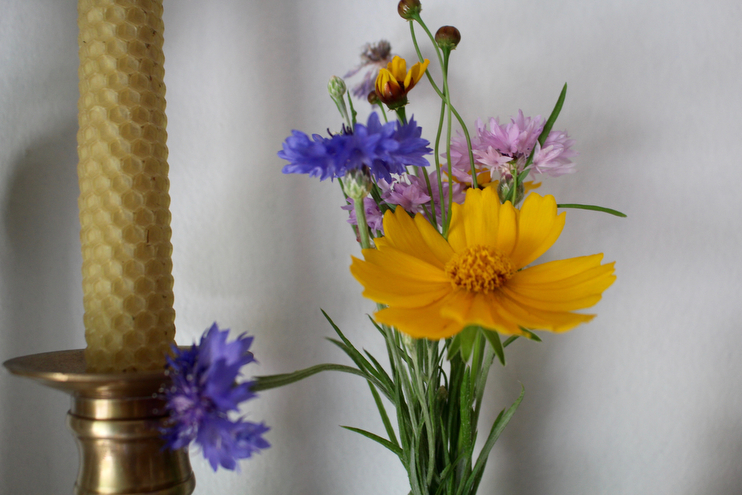 These five are staples in our home during the summer months and I think you’ll quite like them! Keep Bugs Away Spray: To keep bugs away this summer, you’ll want to use essential oils that deter and repel them like: citronella, geranium, lemongrass, lavender, rosemary, tea tree, cedarwood, clove, and eucalyptus. To make this spray combine the following in a small 2 oz. glass amber bottle, or up the ratio of ingredients if wanting to make a large spray bottle to last throughout the summer months. After Sun Aloe Spray: I keep this aloe spray in the fridge to mist on my skin on hot days or if I got a little too much sun. The lavender in this mixture is good for burns and helps repair damaged skin cells, and the aloe is soothes red and burnt skin. You don’t have to keep this in the fridge, but having it cold is a nice touch when your hot and in need of a cool down. It’s a nice facial toner as well! 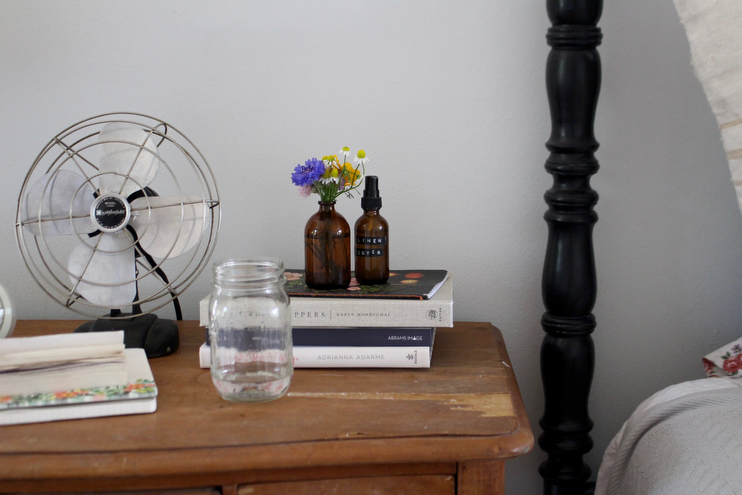 Long Day Linen Spray: This spray is a lovely one to use before naps and bedtime. I have it on my nightstand and mist my pillows and blankets with it every night before bed. It’s really calming and promotes a healthy rest after a full day of summer activities. Sometimes it’s hard to shut down after a long and active day, and I find that this combination of oils really does help us relax. Scraped Knee Owie Spray: I keep one bottle of this spray in my purse and another in our first aid kit upstairs. It’s the perfect remedy for a scraped knee or other minor cuts and scrapes. We use this almost daily as the kids are constantly playing outdoors and I use it too! This blend contains antibacterial properties that help cut down on healing time, and it’s gentle enough to use on toddler skin, making family friendly. Shake and spray! Because there is a carrier oil in this blend it’s important to shake well before applying. Natural Garden Spray: I use a large spray bottle for this recipe (as you could for all of the above if you care to) because I have a lot of garden to cover to keep pests from eating our harvest. After doing some reading about oil safety in the garden and natural bug prevention, I discovered that both peppermint and rosemary essential oils are great deterrents for bugs that can prevent your garden from being destroyed. The use of essential oils in your garden is a useful alternative to using chemicals that can contain harmful properties we certainly don’t want in our hands or on our food. These fragrant oils mask the smell of the pheromones (targeting signals) and confuse insects, thereby causing them to go elsewhere and not munch on your plants. This natural garden spray is also great to use on windowsills if you have an ant or spider problem. To use this solution, spray on the leaves in your garden early in the morning before the sun has risen, or in areas around your home where you know pests to be most prevalent. Head here to make other essential oil remedies at home!